What does your role as Intern involve and what experience have you gained? As an intern I perform tasks related to marketing the exhibitions and public programs that take place in the Noel Shaw Gallery and the Grainger Museum. Some of my activities include gathering contacts of niche groups that would be pertinent to invite to upcoming launches or presentations, as well as coding and analysing evaluation forms from past events. I am also undertaking research on students´ engagement with the Noel Shaw Gallery, which involves carrying out personally designed surveys and interviews. Completing my internship at the Special Collections and Grainger Museum has been an enriching experience, as not only has it develop my marketing skills, but I have also been acquainted with all processes for the proper promotion of events, as well as discovering audiences´ interests and tastes. How did you hear about the Grainger Museum? As an international student from Mexico, I first walked by the Grainger Museum on an occasion soon after my arrival in Melbourne. Afterwards, one of my colleagues from the Master of Arts and Cultural Management recommended that I visit the precinct where he often volunteers because he finds it fascinating. What is your favourite object within the Museum? My favourite object is Percy Grainger´s practice piano from when he was a child, undertaking lessons on it with his mother. In 1888, Percy and his mother Rose moved to Hawthorne, and at that time he was already studying the piano for long hours each day. During that period, the Husband family lived very close to the Grainger´s and they became good friends. When Rose began to make a living from teaching piano, the Husband´s daughters became her pupils. Thomas Husband was a member of the committee formed for Percy´s benefit concert, from which all proceeds would be used for his trip to Germany, where he would continue his musical studies. When Rose and Percy left Melbourne, the Husband family purchased the piano in 1895 and later donated it to the Grainger Museum in 1935. I came across this piano and connected with it during my first visit to the Grainger Museum. I remember putting on a set of headphones located near the entrance of the permanent exhibition and listening to Percy Grainger play Lotus Land Op. 47 No.1 by Cyril Scott. I turned around and saw the piano. I imagined Percy playing and realised that this instrument represents the starting point of his musical story. As well, since British composer Cyril Scott was also one of Percy´s friends at the Hoch Conservatorium during the years he studied in Frankfurt, I felt transported and deeply inspired. 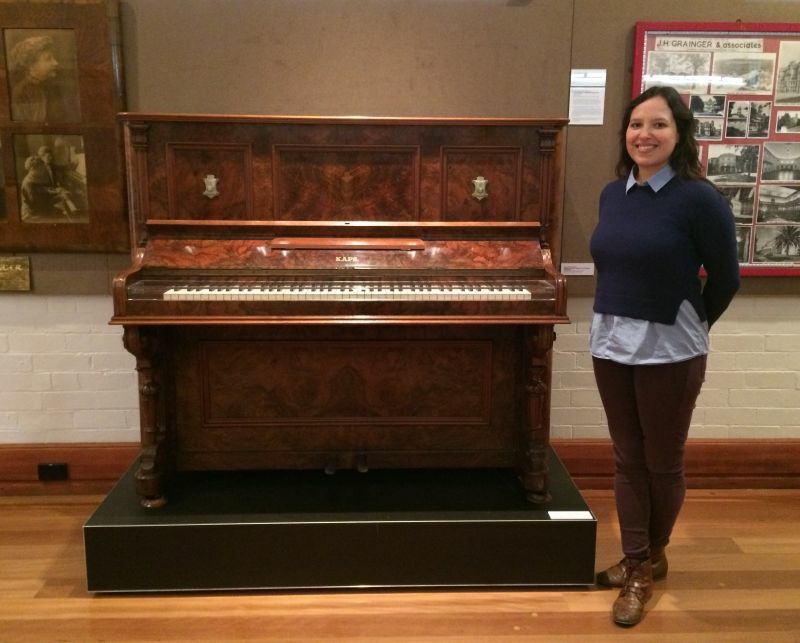 Many thanks to Daniela for sharing her experiences and favourite Grainger item with us. We wish her all the very best for the rest of her Internship and studies.